“Do you think we will get dirty? 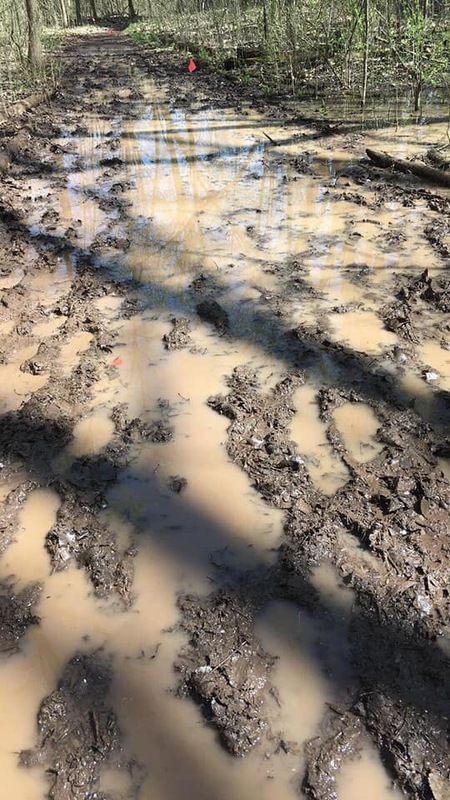 Yep, there are a few places on the trail that are a little muddy.” This is a conversation we heard at the start line of the Apple Creek 50k this past Saturday. 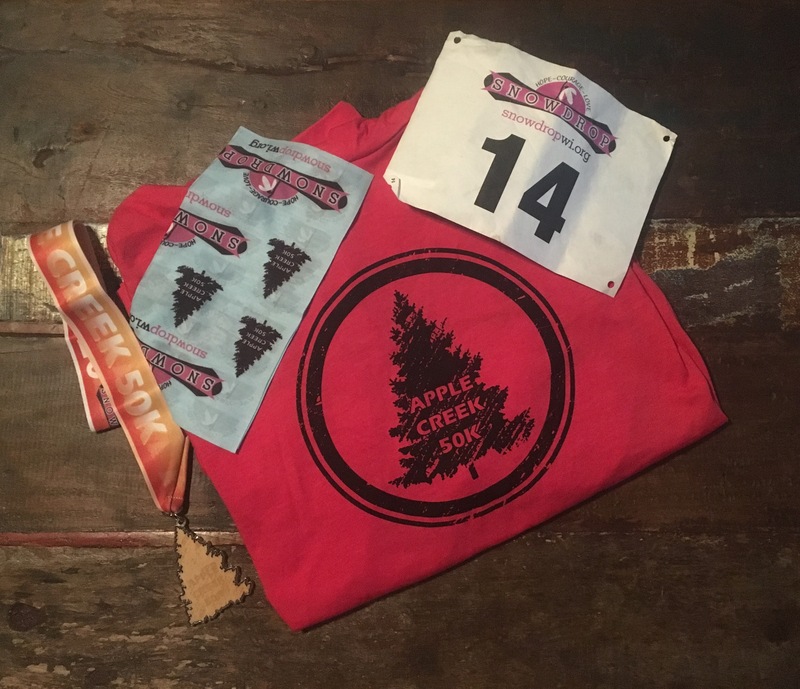 I laughed…if the course was anything like it was last year there were going to be more than a “few” muddy sections of the trail. Last year it was ankle deep and super sloppy. The morning temps were crispy, but clear and the forecast suggested we were in for perfect running conditions. Amanda and I met up in the parking lot across from the start/finish line. 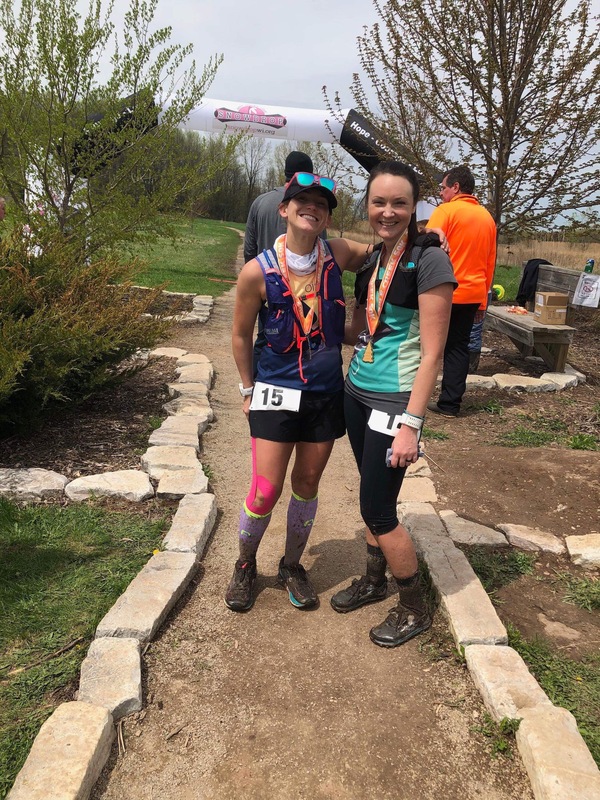 This was her 1st ultra marathon and my 1st race of 2018. We were both hesitant and nervous. This is a low key event, which I love. They have 2 options to complete the 31 mile distance: relay or solo. The majority of runners getting prepped to start were running the relay. Regardless we were all starting together at 6am. The course is set up as a 7.5 mile (ish) loop that you do 4 times. We set up our gear at finish line so that we could quickly grab what we needed as we concluded each loop. The race organizers had 2 tents set up with tarps for runners to deposit their gear, but we opted to stay out of the fray and do our own thing. Once our gear was dropped off we headed over to the packet pick up tent which was a few steps away. This is set up is awesome…gear drop, packet pick up, start/finish line, and aid station were all within 50 feet of each other. We had our race bibs picked up in under 5 minutes and were able to get to the start line without any challenges. The RD came on the PA system and said a few words, the National Anthem was sung, and before we knew it…it was time to run. The hill at the start is the worst! Straight up and seems to go on for days. The beautiful houses are a nice distraction to the climb that the 1st mile presents. Once up the hill the course continues in town on roads for approximately 1.5 miles before turning on to the 1st trail. We could not have asked for better weather to run in. The day started mid 40s with little wind and by the end of the race we were in mid 60s with the sun shining…pure perfection. Once on the trail it became very clear we were in for an adventure through the mud pits. The 1st pass on the trail wasn’t too bad, but as runners continued to loop around the mud turned to liquid and became super slippery. You never quite knew when you stepped just how far down you would descend into the mud. All we could do was laugh and embrace the sludge that was going to be part of our experience for the better part of this race. Our best efforts to stay clean were blown up quickly, no matter where you went the mud was deep…so, we started going straight through it. After while we found that if you stayed on your toes and did not let your heels hit your shoes would stay on. The mud was powerful and took a lot of energy to get through, but made the trail that much more fun! We bounded through the mud and ran on the sections that were solid and dry. The 1st trail pass as a loop that returned us to the road that brought us to that trail. We headed back up the hill and into the residential area to connect to the 2nd trail pass. This portion of the course had more open areas leaving us exposed to a few gusts of wind, but nothing outrageous. Now, according the course map the 2nd trail pass was shorter than the 1st, but man…it did not feel shorter. The prairie section was wide open due to a controlled burn that must have happened a few days prior to the race (the ground was still black with ash and it smelled like burnt plastic). We traversed through winding single track, over fallen trees, up railroad stairs, and finally arrived back at the start/finish. Both trails were beautiful and well maintained. One of the unique features of this race is the purpose for which it was founded. The goal is to raise money and awareness for the Snowdrop Foundation WI. The mission of this group is to assist patients and families at Milwaukee’s Children’s Hospital through funding for continued research to eliminate childhood cancer. They also provide scholarships for college bound pediatric cancer patients and survivors. Along the course were signs with the pictures of children that had been or are currently involved with the Snowdrop Foundation. Talk about motivating! If these brave kids can fight for their lives we sure has heck could finish this race. I was scared to line up to this race, actually any race. It had been months since I had raced and my mileage was shakey all winter as I battled through an injury. I honestly did not know if I could or would finish. Thank goodness for my friend Amanda! 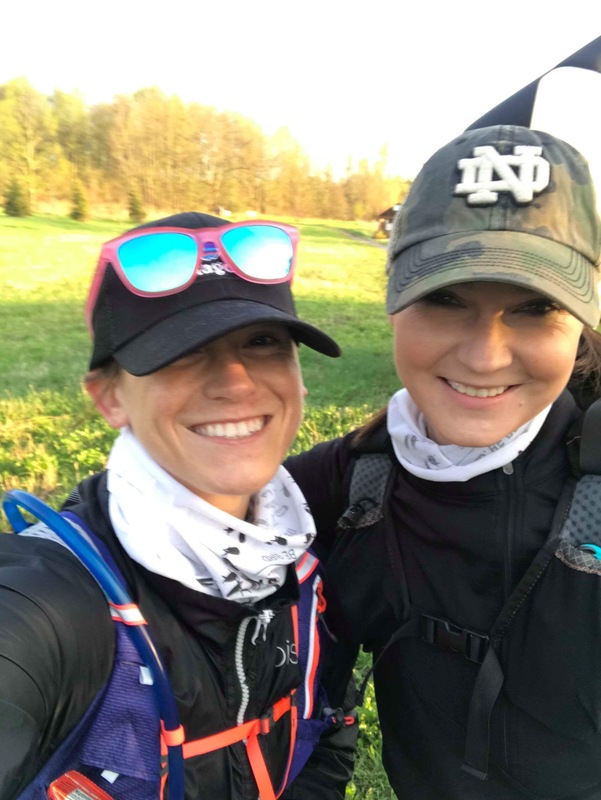 We met 2 1/2 years ago at the Milwaukee Marathon when we both hit a low in the race. Together we forged on and finished. It was Amanda’s 1st marathon. 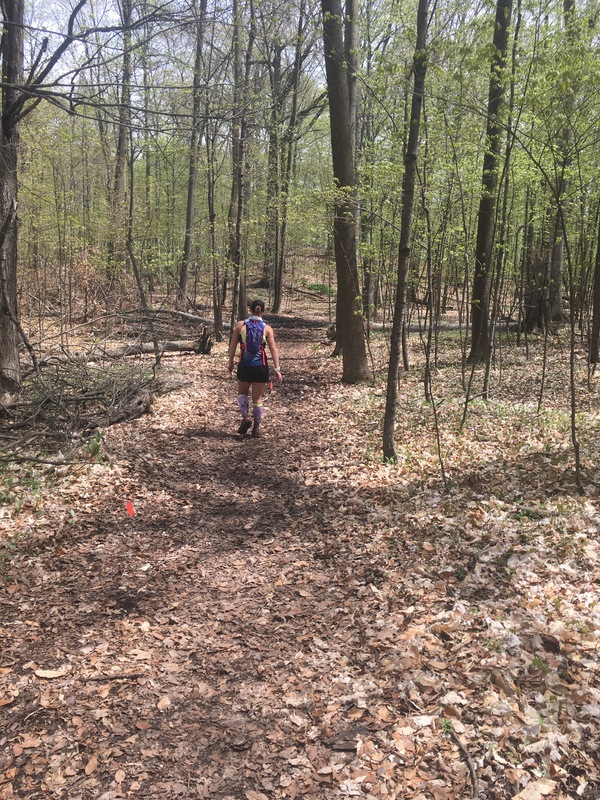 Apple Creek was to be her 1st ultra…fitting that we were going to run together again. Her conversation and support put my nerves in their place. We had so much fun talking, laughing, swearing, joking, singing, and dancing. For those that think running is a solo sport, they are wrong…it takes a village. I am so grateful our paths crossed years ago and I could not have imagined this race going as well as it did without her. The last loop was by far our toughest, but we did it! Ringing the bell and pushing up the hill brought on several “last” comments…this is the last time we go up this hill, last time through this section of mud, ect. We played music on the back half of this loop and jammed out to old school rap. The day was amazing, dare I say perfect. #39 complete (40 by 40)…on to Cellcom Green Bay Marathon this upcoming Sunday. 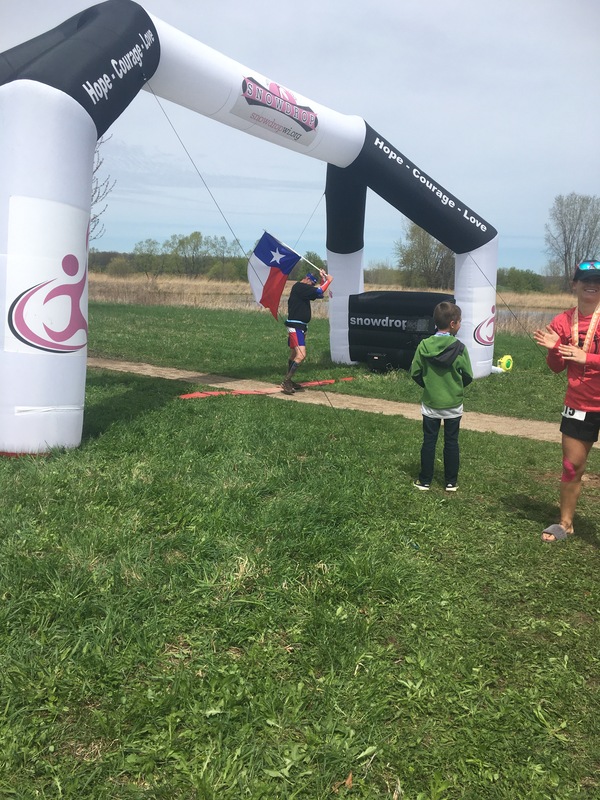 Tailwind Nutrition – I filled my bottle with 2 scoops of Berry with 24oz of water and refilled at the start/finish line with Orange (it was the on course option – WIN). After loop 2 I added in Swedish Fish to my fueling plan in addition to Tailwind. Along the course I also had a few gulps of Coke. My energy level stayed consistent and stomach did not get upset. 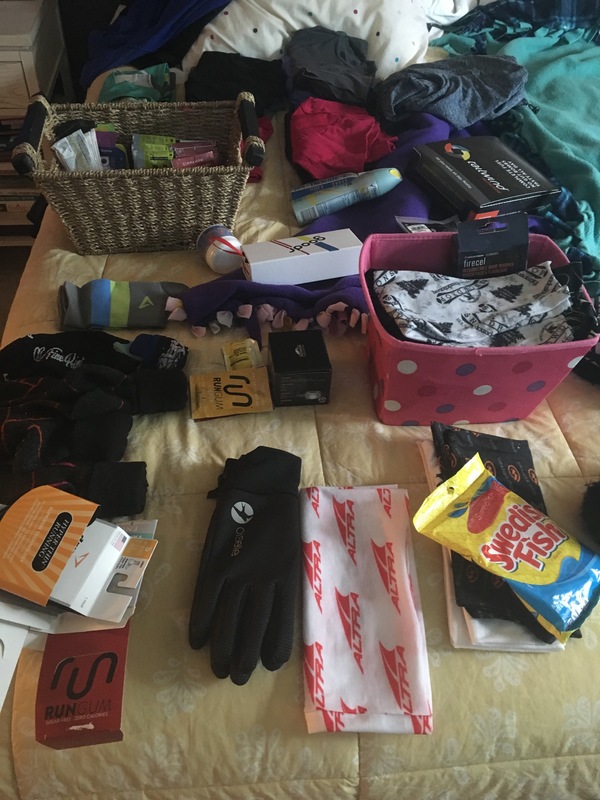 Oiselle – The temps were in the mid 40s to start. I started with black Go Jogger Capris, Wazelle short sleeve, Volee team singlet, Lesko bra, and Wazzie Wool 1/2 Zip. I was able to peel off a layer each loop as the temps rose – it was perfect. Run Gum – I had 2 pieces of Mint about 30 minutes before the start of the race on my 50 minute drive. I was tired and need to get my head in the game. On the last loop I popped 2 more pieces of gum, Cinnamon this time. It was the boost I needed to finish up the last 2.5 miles. Trail Toes Cream – I slather this stuff on before I put my socks on to prevent hot spots and repeated when I changed my socks after loop 2. Our feet were wet throughout the race with the muddy trail sections. I love that this product can go on wet surfaces, that is not the case with other lubes that I have tried. I was expecting to have blisters when I finished…I did NOT!!! I am so impressed. Salt Stick Caps – I forgot to follow my regular schedule of 2 per hour to prevent cramping. 2 hours in I started to cramp and feel sluggish. I took 3 tablets and within 30 minutes the cramped had stopped and my stomach calmed. From that point on I took 2 every hour. FitSok – ISW Isolwool Crew have been my go-to socks for trail running over the past few years. Combined with Trail Toes I have been able to avoid blisters even in the wettest of conditions. The height of these socks keeps trail debris out and they stay put without being too tight. 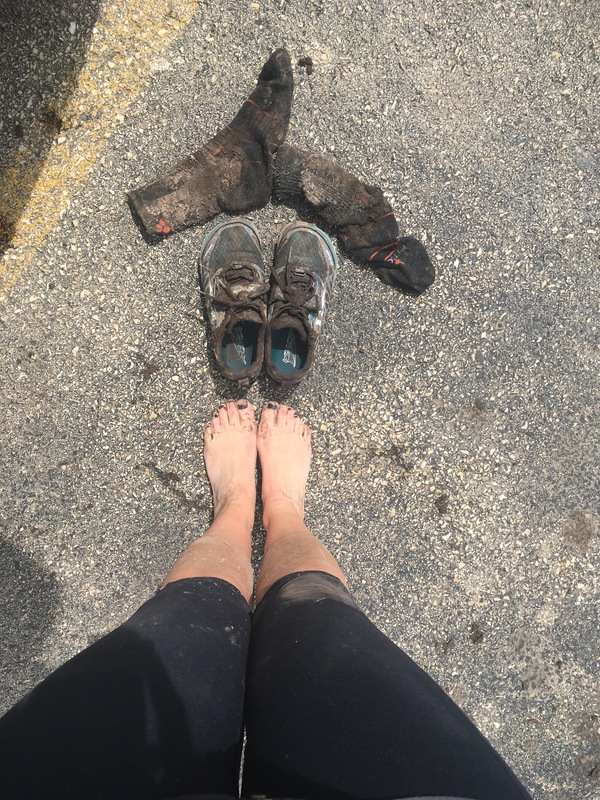 I changed socks twice throughout this race and was able to salvage them when I got home. They washed up great and are ready to go for next adventure. Altra King Mt – I have worn these shoes all winter and loved the aggressive lugs. They grip to evenly to slippery surfaces (like icy roads). The course was not as technical as some trails I have run, but the mud made getting traction near impossible at times. The shoes gripped and gave me the control I was looking for.